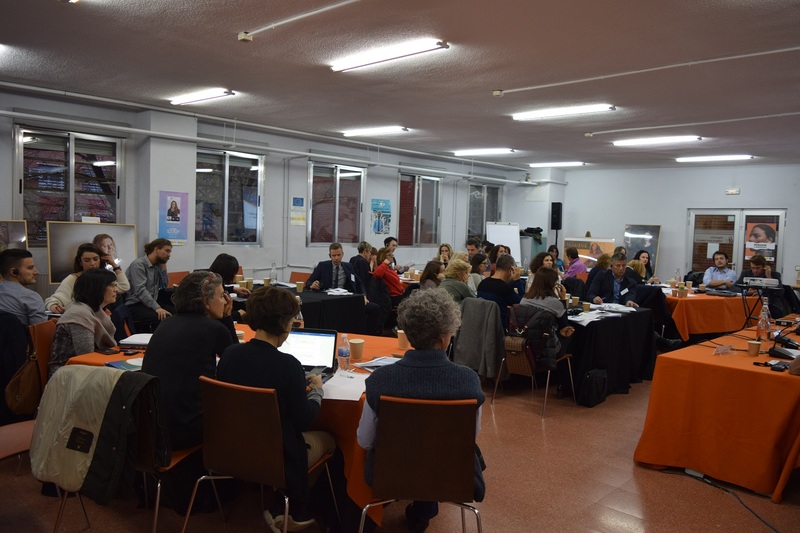 On 20-21 November 2018 the EURoma Network organised the European Seminar ‘Using ESI Funds to provide adequate housing solutions for Roma families’ in Madrid (Spain). The meeting gathered Network partners -i.e. 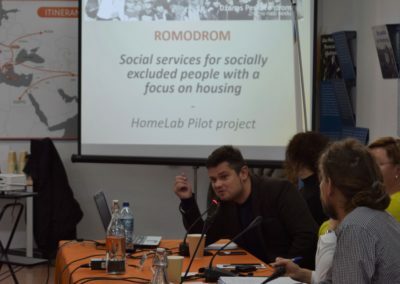 public authorities managing ESI Funds (Managing Authorities/Intermediate Bodies/other management bodies) and those in charge of Roma policies (National Roma Contact Points)- of ten EU countries, together with other relevant bodies at European and national level with experience and/or competences on housing interventions for disadvantaged groups, including Roma population. The seminar was combined with a Network Management Committee meeting. 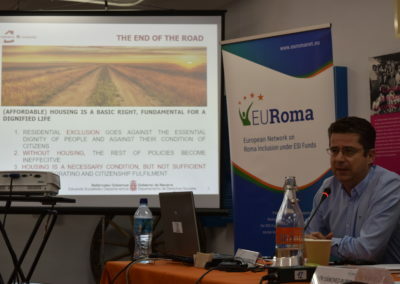 Against this background, and concerned about the high share of Roma who are not adequately housed, EURoma Network organised this European seminar with the aim of boosting an effective use of ESI Funds, notably ERDF and ESF for the improvement of housing conditions of the Roma population. The meeting, which was combined with a Network Management Committee, gathered Network partners -i.e. 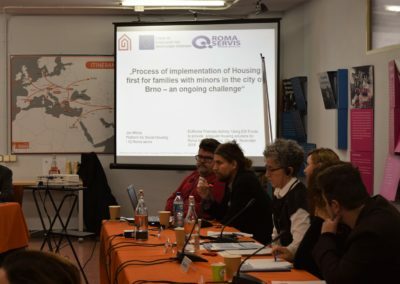 public authorities managing ESI Funds (Managing Authorities/Intermediate Bodies/other management bodies) and those in charge of Roma policies (National Roma Contact Points)- of ten EU countries, together with other relevant bodies at European and national level with experience and/or competences on housing interventions for disadvantaged groups, including Roma population. It also counted on the participation of the European Commission, the EU Agency for Fundamental Rights (FRA) and the Office of the United Nations High Commissioner of Human Rights. 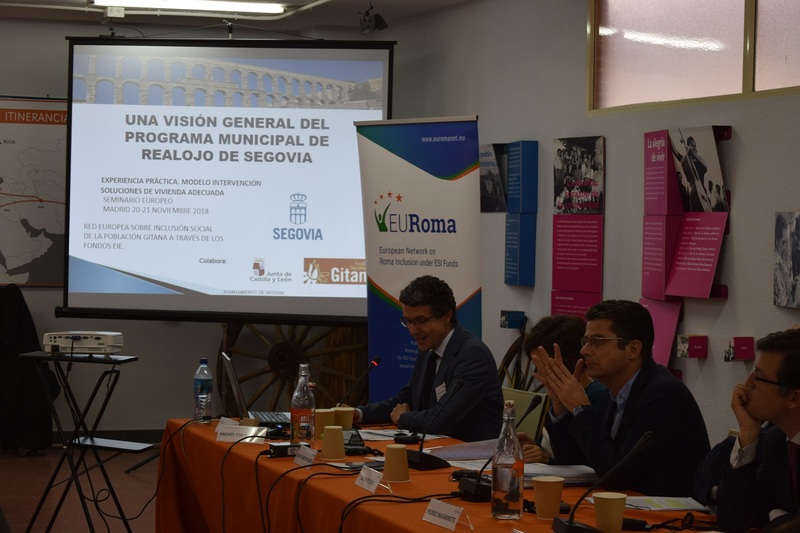 Isidro Rodríguez Hernández, Director of the Fundación Secretariado Gitano (FSG) (EURoma Network Technical Secretariat) welcomed participants to the first thematic seminar of the Network and to the meeting venue, the headquarters of the Foundation. 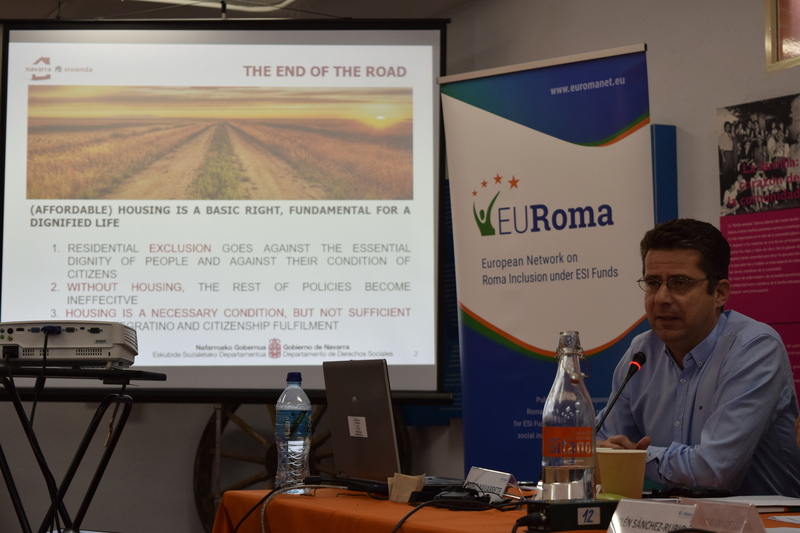 He stressed the relevance of the topic of the seminar, a key factor in inclusion/exclusion processes: dignified and non-segregated housing is a precondition for advancing towards equal opportunities for disadvantaged groups in general and Roma in particular. 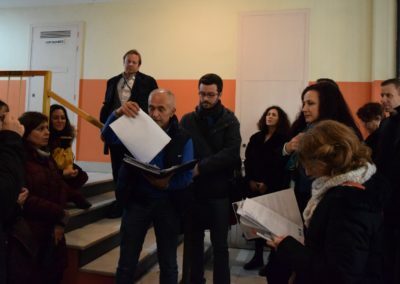 Therefore the importance of initiatives such as this one to learn from each other’s successes and mistakes and to explore how to take full advantage of the opportunities offered by the current and the upcoming ESI Funds programming periods to address the situation of the many Roma citizens who cannot enjoy their right to adequate housing. 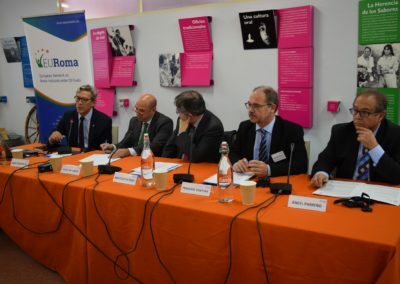 EURoma trusts that housing for the most disadvantaged groups and specific measures targeting their needs are well reflected in the Regulations and in the Operational Programmes of the new programming period. Angel Mª García Frontelo, Deputy General Director of Spanish ESF Managing Unit (UAFSE) (Ministry of Labour, Migrations and Social Security), Anatolio Alonso Pardo, Deputy General Director of ERDF Managing Department (Ministry of Finance) and Ángel Parreño Lizcano, General Director of Services Families and Childhood (Ministry of Health, Social Services and Equality), acting as National Roma Contact Point, were in charge of opening the meeting on behalf of the Spanish bodies responsible for ESI Funds and for Roma policies. Mr. Frontelo insisted on the combination of ESF and ERDF as a factor of success in housing interventions. He also agreed with previous speaker on the importance of ensuring dignified housing for Roma people as precondition to inclusion. But we should not forget that housing should be combined with employment in order to guarantee a sustainable change. 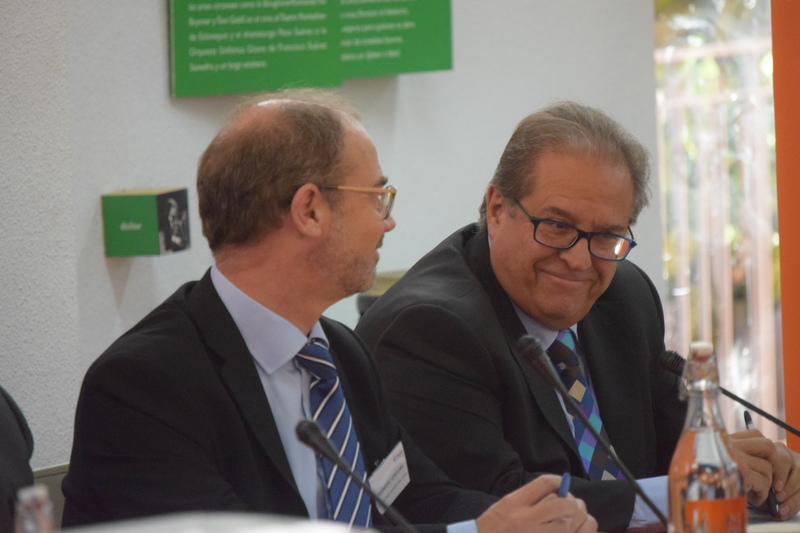 He welcomed the organisation of the seminar at this key moment in the negotiations of the upcoming ESI Funds programming period and trusted that the outcomes of the reflection can feed into this process. He trust that the upcoming ESF + Regulation includes, likewise the current programming period, an investment priority on Roma. Mr. Alonso agreed on the importance of coordination between different ESI Funds. 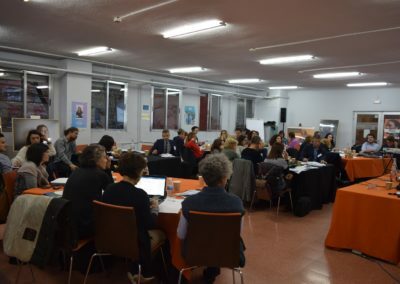 Structures such as the Spanish ‘Interfunds Committee’, which brings together representatives of the ERDF, the ESF and the NRCP are interesting tools in this regard. He welcomed the advances in the current programming period that allow investments in housing, notably within the framework of the urban development initiatives. 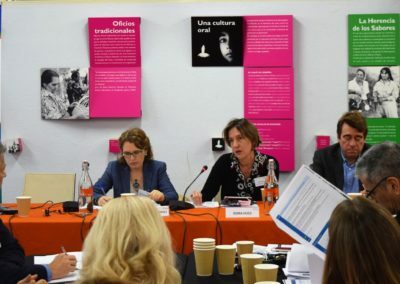 In addition, some of the regional OP include housing interventions, targeting disadvantaged groups and in some cases even mentioning Roma explicitly. However, further efforts should be done in the current and in the upcoming programming period to ensure that housing investments reach disadvantaged groups. 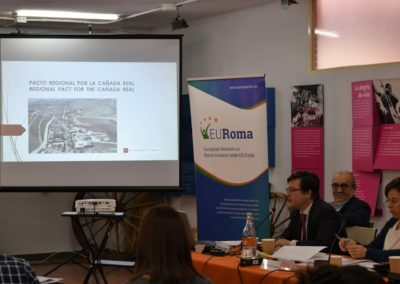 For Mr. Parreño, the high share of Roma that still live in a situation of residential exclusion should be an issue of concern. The existence of slums and substandard housing, often in segregated spaces, limits the capacity of their inhabitants to exercise their rights on an equal footing with the rest of the population and be full-fledged citizens. It is essential to join efforts, combining the political with the financial level, to address this situation. As one of the priority areas of the Spanish NRIS and thanks to the political commitment of different public administrations, progress has been made as regards the objectives set. 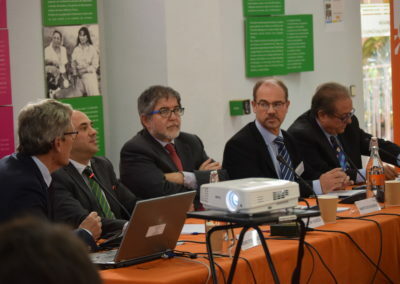 One of the key initiatives included in the NRIS is the ‘Study-Map on Housing and the Roma population, Spain’, which offers objective data that can feed into the political decisions and the design of specific policies/programmes (in fact pending and/or urgent issues identified have been already included as priority areas in the national strategy and the recent Housing State Plan, such as the eradication of shanty towns). Finally, Francesc Ventura Ribal, Director of the Department for Social Cohesion and Intercultural Relations of ‘la Caixa’ Foundation (EURoma co-funding entity) highlighted the importance of networking between different actors in order to look for solutions to problems and to promote continuous improvement and achieve impact. Therefore the relevance of supporting initiatives such as EURoma and spaces of reflection such as this seminar. 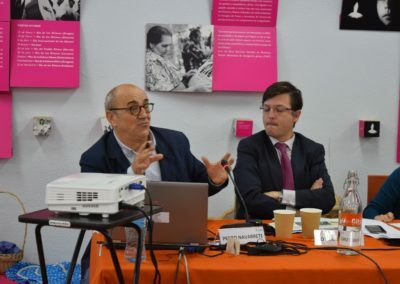 Bahram Ghazi, from the Office of the United Nations High Commissioner for Human Rights in Geneva, provided an overview of the international framework establishing the right to adequate housing. 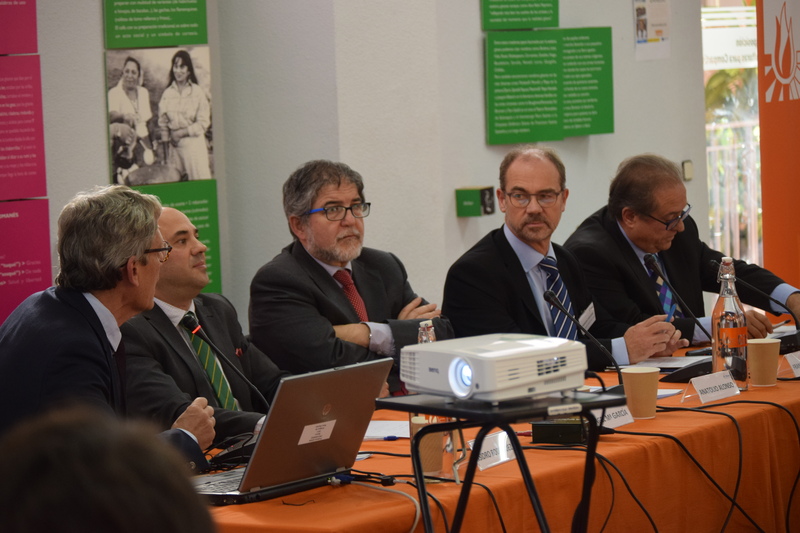 He particularly focused on the elements of adequate housing as defined by the Committee on Economic, Social and Cultural Rights in line with the International Covenant on Economic, Social and Cultural Rights (article 11.1. ), which recognises this right as an integral part of the right to an adequate standard of living. 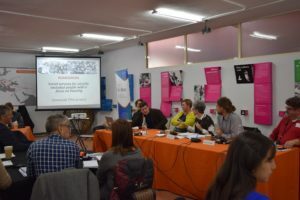 Taking a human rights´ approach to urbanisation involves crucial aspects such as non-discrimination and equality, free, active and meaningful participation, avoiding spatial segregation or considering the needs of the most vulnerable. 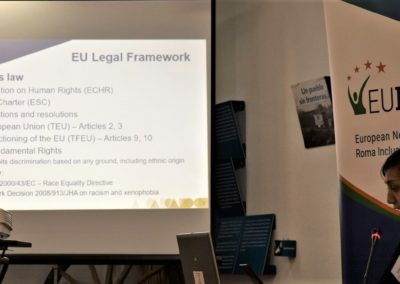 Sheena Keller, from the EU Agency for Fundamental Rights (FRA), first refered to the right to housing and non-discrimination (including in access to housing) as enshrined in the different EU and international human rights law instruments. 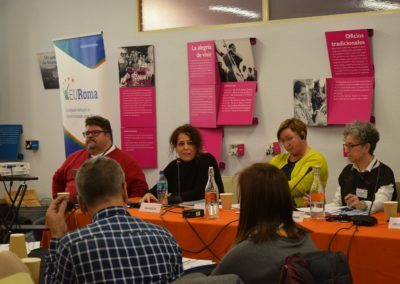 She then presented the main outcomes of a FRA survey addressesing the housing situation of Roma in the EU that shows the need for further efforts in this field. The survey, which focuses on areas with high density of Roma population (usually in settlements), shows that housing conditions of Roma have not changed very much in the period considered (2011-2016) and that there is still a huge gap with the majority society. 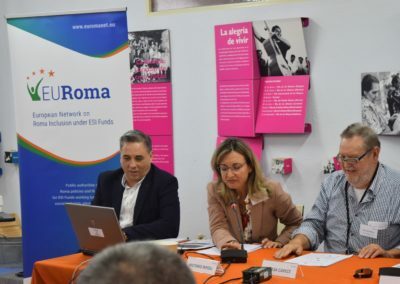 The findings show worrying data such as the fact that 30% Roma live in housing without tap water inside; 38% live in housing without a toilet, shower or bathroom; and 10% in housing without electricity. In addition, discrimination in access to housing continues to be a problem (as high as 41% of respondents felt discriminated for being Roma when looking for a house). 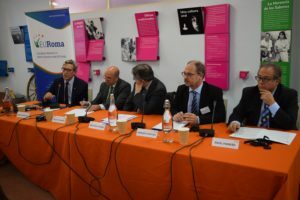 She ended with some FRA recommendations to address these challenges, including using the full potential of the ESI Funds and the Fund for European Aid for the Most Deprived (FEAD) to assist Roma who live in conditions of severe material and/or housing deprivation, and respecting, as required by the European Pillar of Fundamental Rights, the right of persons in vulnerable situations, such as many Roma, to appropriate assistance and protection against forced eviction. European Commission representatives Dora Husz (DG Justice and Consumers, DG JUST), Dominique Bé (DG Employment, Social Affairs and Inclusion, DG EMPL) and Andor Urmos (DG Regional and Urban Policy) looked into the consideration and opportunities for housing interventions benefitting Roma families within the EU political and financial frameworks, considering the respective competences of their DGs. Ms. Husz referred to the consideration of housing in the political framework, notably in the EU Framework for National Roma Integration Strategies and the European Council recommendation on effective Roma integration measures. Although housing is one of the priority areas of the different political instruments, Commission’s annual assessments on the EU Framework show that it is one of the most challenging areas, where not much improvement has taken place. Therefore the importance of continue focusing on this area and to maintain it as priority in the funding and policy frameworks. Mr. Bé recalled an additional political commitment as regards housing: the European Pillar of Social Rights, which includes one principle (number 19) related to housing of people in need. 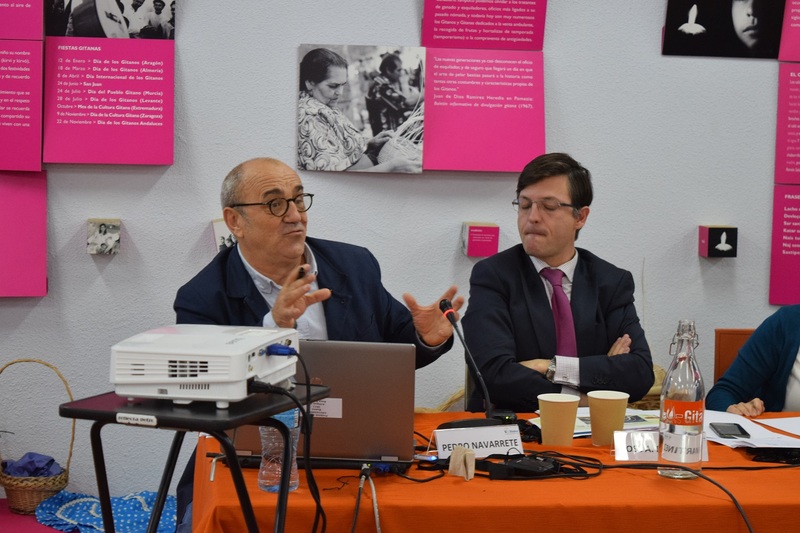 However, according to Mr. Bé, while we count on a wide range of legal texts supporting the right to adequate housing, the reality is different and we face a structural problem: the lack of affordable (social) housing. This is an issue that should be object of attention, it is not a question of investments but of policy. In addition, social housing is not only about building but everything around it (e.g. having a job…). Mr. Urmos presented the general framework in which ESI Funds/cohesion policy will be included in the 2021-2027 programming period, notably the proposal for the Common Provisions Regulation (CPR), which sets the main rules governing the seven shared management funds, including the ERDF and the ESF Plus. He pointed to some of the lessons learnt during the current programming period that should be taken into account in the negotiations of the 2021-2027 programming period that are currently taking place. 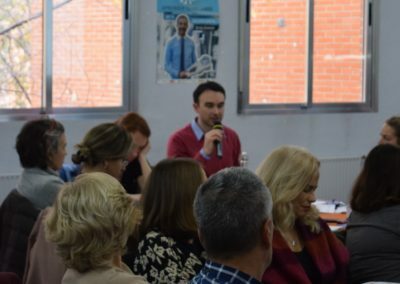 These include: aligning investments with legal and policy priorities/ recommendations, avoiding investments that promote segregation, connecting EU investments with the EU Charter of Fundamental Rights, interconnecting the investments (e.g. housing with employment, education…), taking full advantage of the opportunities offered by the urban development strategies, involving local authorities. 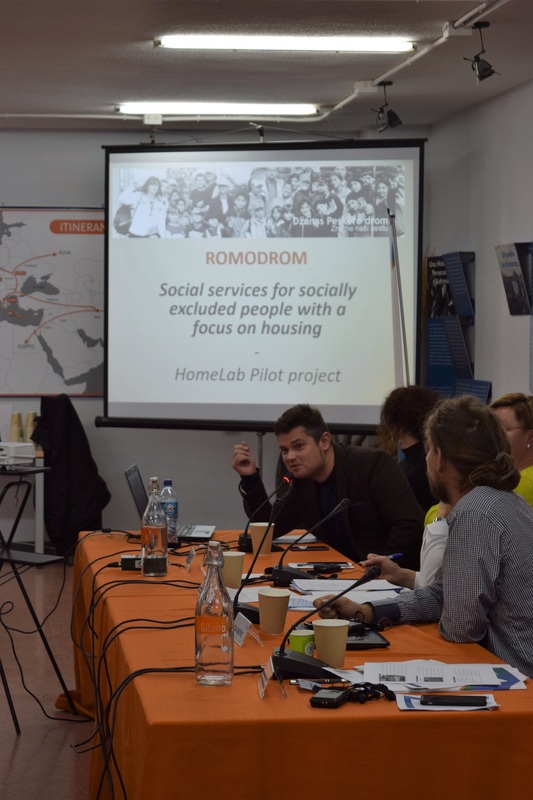 Following the presentation of the general framework, a number of initiatives using ESI Funds (notably ESF and ERDF) for housing interventions benefiting Roma families were reviewed. 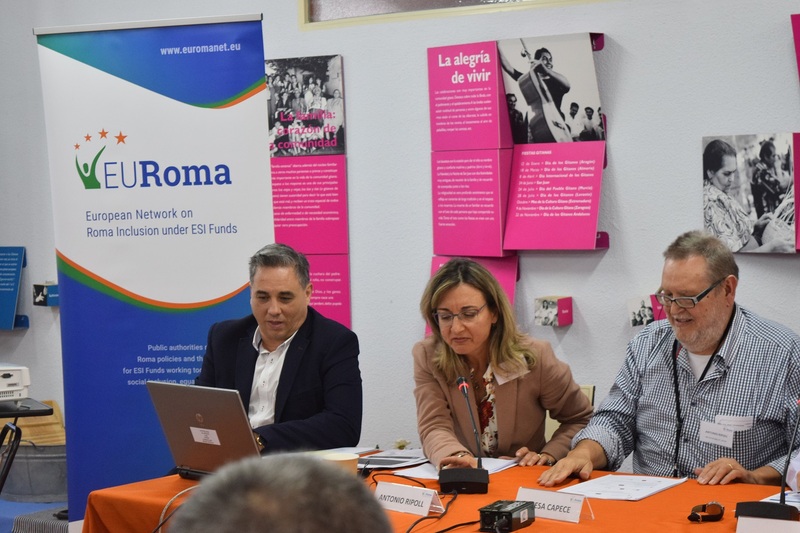 Presentations aimed to address the potential of ESI Funds to improve the situation of Roma families (both through targeted, mainstream and territorial approaches) and to identify critical aspects related to implementation (e.g. combination of funds…) as well as (potential) challenges faced/perceived and possible solutions. 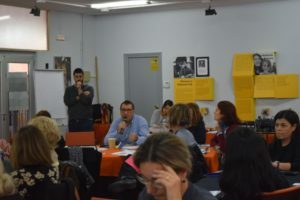 Eusebio González, Director of the Social Housing Agency, the body in charge of public housing in the region of Madrid (Spain), shared with participants the first of these initiatives: the resettlement and support programmes for families living in two settlements of the Region of Madrid that are currently being undertaken by the Agency within the Regional OP of Madrid (ERDF funds). With these funds, the Agency buys the apartments (through public procurement) and, after rehabilitating and preparing them, allocates them to the families (using a rental scheme). 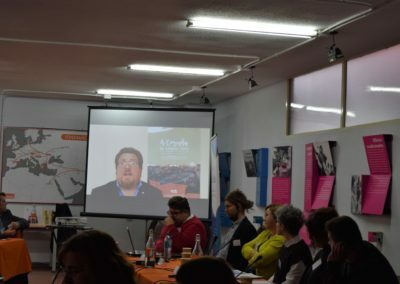 The ‘Resettlement Support Programme for Families experiencing chronic social and housing exclusion’ (PARES Programme) funded under the OP of the Region of Murcia (Spain) is another initiative using a combination of ESI Funds, notably ESF and ERDF, for providing housing solutions for Roma families. Antonio Ripoll, Head of the Planning and Evaluation Service of the Directorate-General for Families and Social Policies of the Regional Government of Murcia explained the experience within this 4-year programme that aims to break the circle of exclusion through an intervention itinerary aimed at social and labour inclusion and access to housing. 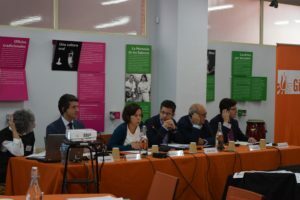 Key principles include the combination of funds as well as a wide partnership between public and private actors, notably the regional and local governments and the organisations responsible of the development of the project: Habito Murcia Association (composed of Cáritas Región de Murcia, Fundación Secretariado Gitano y Copedeco S. Coop.). 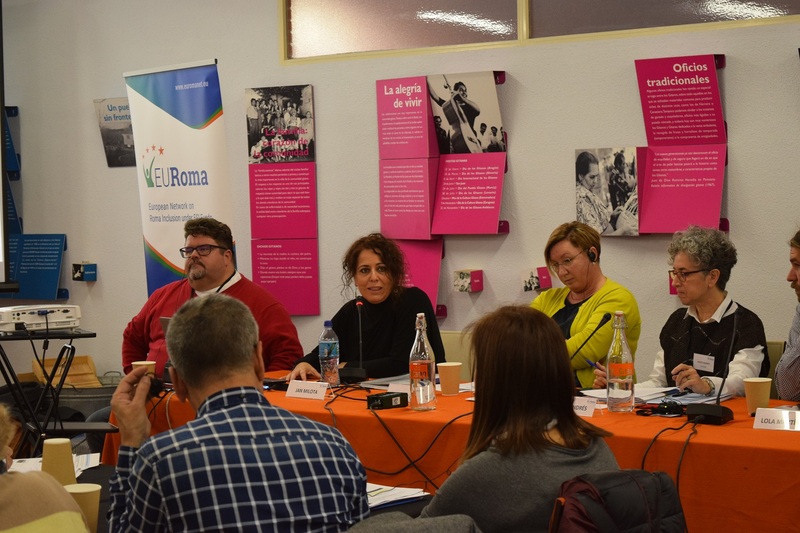 Teresa Capece of the Italian Agency for Territorial Cohesion (Managing Authority) provided an overview of the strategies and tools to support Roma inclusion in the Italian National Operational Programme Metropolitan Cities and notably housing inclusion. 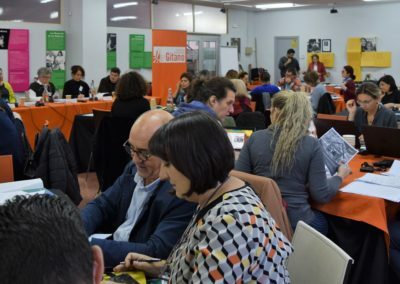 This national programme, dedicated to sustainable urban development, aims to improve the quality of services and to promote social inclusion in 14 metropolitan cities (which act as Intermediate Bodies). Thanks to the availability of both ESF and ERDF funds, it combines actions related to infrastructure (social housing) with actions related to housing inclusion. In addition, its multidimensional approach calls for collaboration of different administrations, sharing visions and responsibilities. 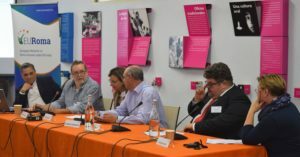 Speakers and participants perceived that elements such as the potential of the combination of different ESI Funds (notably ESF/ERDF), and therefore hard/soft measures; the increased dimension of projects in terms of length and scope and the possibility to develop wide partnerships to implement the actions represent an added value of using ESI Funds. Challenges identified include: the effective combination of soft/hard measures, the sustainability of projects, the difficulty to get some actors on board (e.g. municipalities), the difficulty to collect data and report on certain indicators, the (un)eligibility of certain expenses (e.g. privately owned housing), general aspects related to administrative management, public procurement rules and the domestic regulatory framework. In addition it was highlighted that some of the models of intervention that have proven their value, such as the integrated approach, are time consuming and consequently implementation may not always be in line with ESI Funds rules on recommitment and performance review. 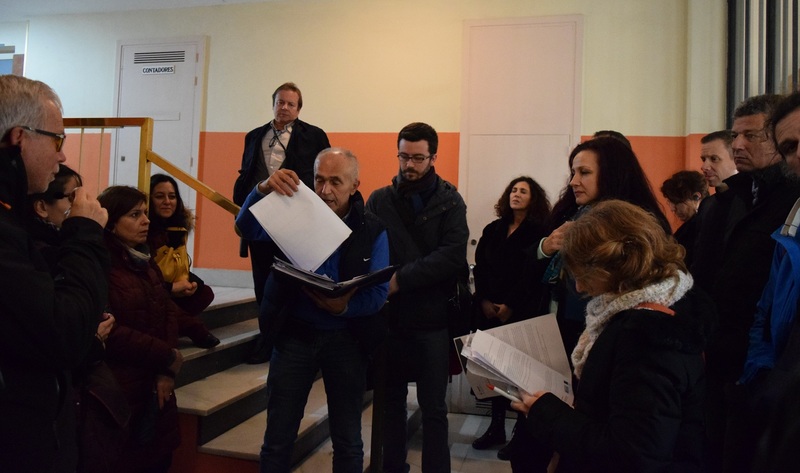 Jan Milota, Social worker of IQ Roma servis, z.s. 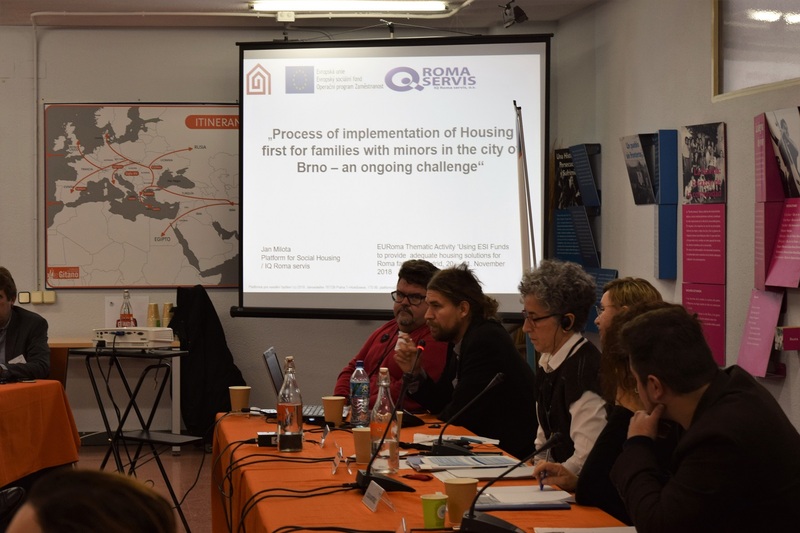 presented an initiative to develop and test whether family homelessness of both Roma and non-Roma families can be ended through a ‘Housing First’ approach in Brno (Czech Republic). 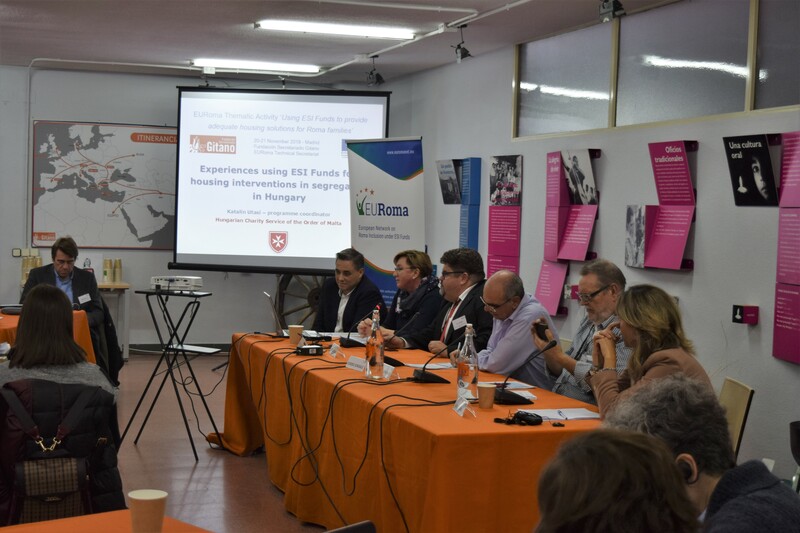 Implemented together with the Brno municipality (owner of the apartments and in charge of overall coordination of local public and private partners) and the Ostrava University, the project aims to pilot this new model and create a model to be piloted in Brno and in other cities. 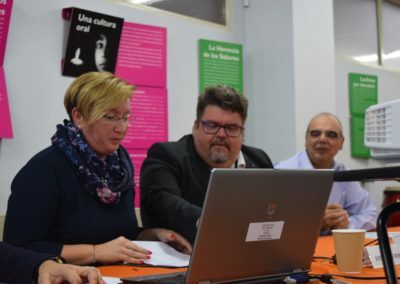 Lola Martínez, Director of Programmes of Spanish Habito Murcia Association (composed of Cáritas Región de Murcia, Fundación Secretariado Gitano y Copedeco S. Coop.) 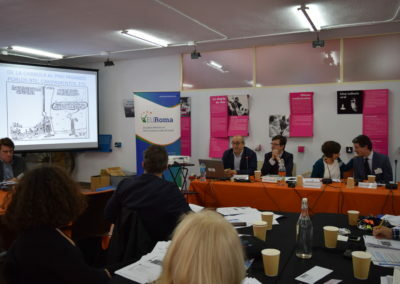 focused on the methodological aspects of the ‘Resettlement Support Programme for Families experiencing chronic social and housing exclusion’ (PARES Programme) previously presented. She stressed some keys for the accompaniment, such as high doses of flexibility, multidisciplinary and coordinated interventions, a comprehensive approach addressing all relevant areas (e.g. training, economic, personal, social/cultural participation, administrative, legal, habitational, health, minors…), intervention at all levels (individual, family, group and community) and before, during and after the rehousing processes, the prevention of possible participant’s dependence, a clear understanding of participants’ complex life situations and interpersonal difficulties, bearing in mind that there is an imbalance in the relationship and, a key element, never forgetting that the protagonist is the participant. 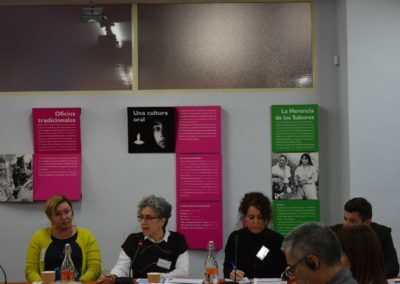 Katalin Utasi of the Hungarian Maltese Charity Service of Pécs (Hungary) also referred to the methodological aspects, and notably the soft measures, of the housing interventions in the segregates in the city of Pécs previously presented. In addition to the construction/ refurbishment work, the projects comprise soft measures such as: Network of family mentors, counselling, clubs, workshops, small projects/actions, education, children’s programmes, competence development and training, fora, networks, dissemination, employment and quality control. The intervention approach used is holistic, complex, pragmatic, evidence-based, customised and based on a process focused on inclusion, diagnose-based development and follow-up. Daniel Bakeš, of Romodrom o.p.s. presented the HomeLab – Integrated Housing and Labour Services in the Social Rental Enterprise model in which the organisation is involved. 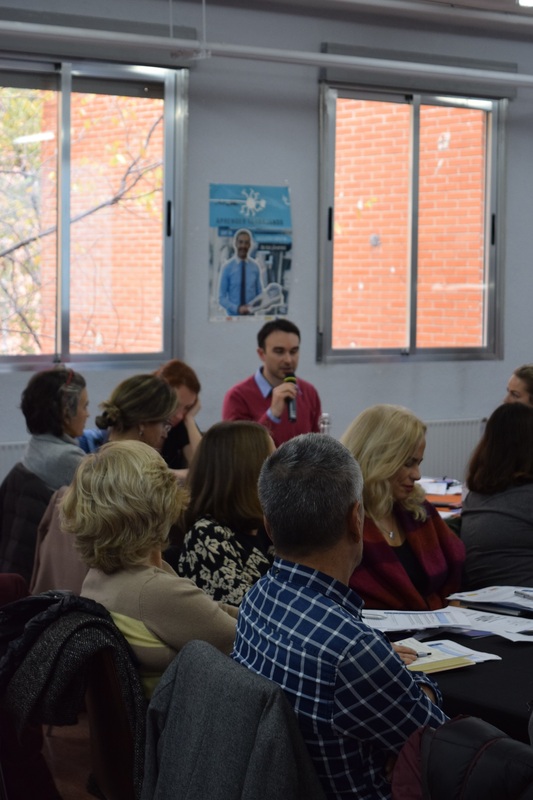 Supported by the EU Programme for Employment and Social Innovation (EaSI), this project (undertaken in four countries) aims to improve, through an integrated approach, the housing and labour situation of socially excluded households in order to improve their living conditions. It helps move the families living in unfavourable housing (legal/illegal hostels, shelters, poor quality housing etc.) to standard housing for an affordable price and to help them manage their financial situation by getting employment or other type of legal job that provides them financial sustainability. 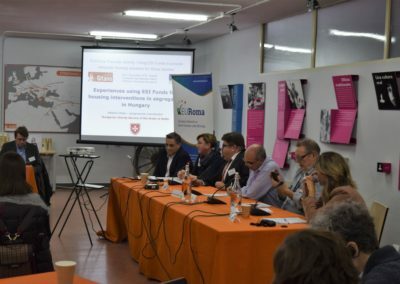 The project is based on on the Social Rental Agencies (SRAs), which are non-profit housing institutions addressing the housing problems of poor and vulnerable people with specific barriers to accessing housing. And it goes one step further by complementing the housing market services with social and labour services that enable families to support themselves. A crucial element for success is to base housing interventions on real needs; therefore the importance of counting on regular analysis of the reality that help guide actions. 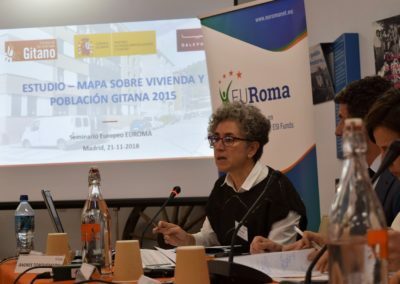 The Spanish ‘Study-Map on Housing and the Roma population, Spain’ previously mentioned is an example of this type of analysis. 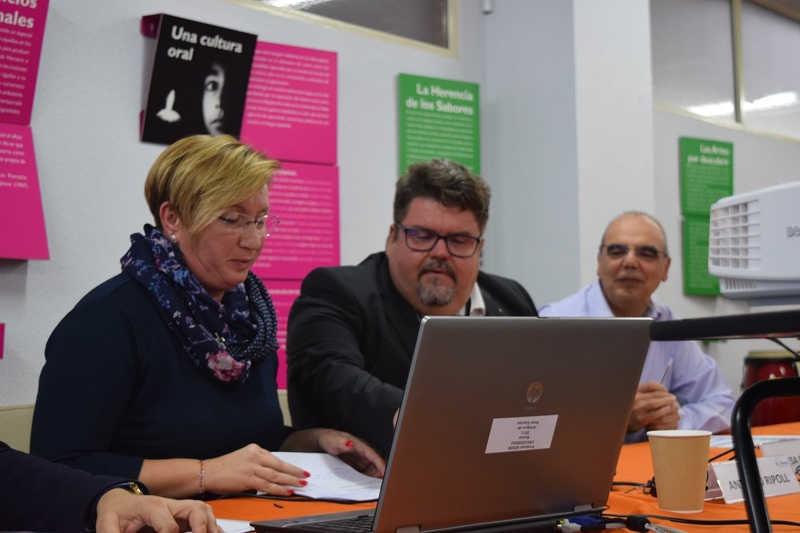 Maite Andrés, Head of Social Inclusion Department of Fundación Secretariado Gitano (FSG) further developped on the objectives, methodology and results and products of this analysis, among them a number of interactive maps. 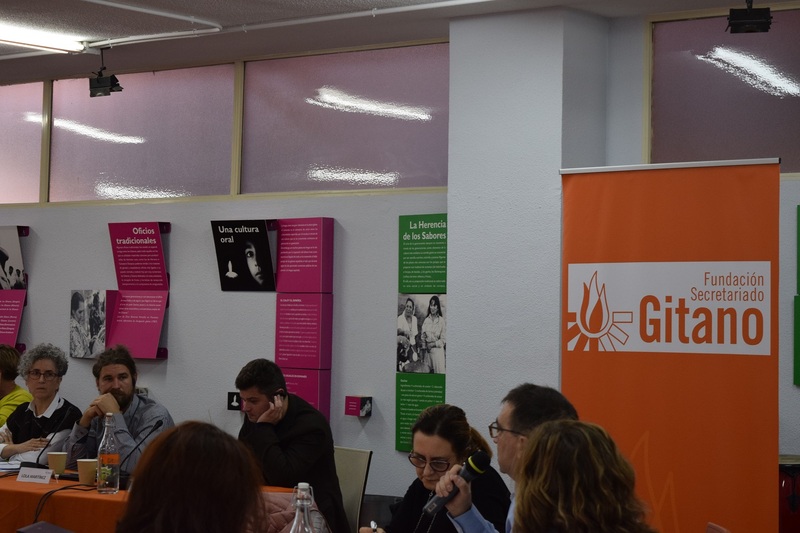 The Study-Map was elaborated in 2015 by the Fundación Secretariado Gitano, together with Daleph (following a call launched by the Ministry of Health, Consumers and Social Welfare) as one of the measures proposed by the Spanish NRIS and is a follow-up to the one undertaken in 2007. 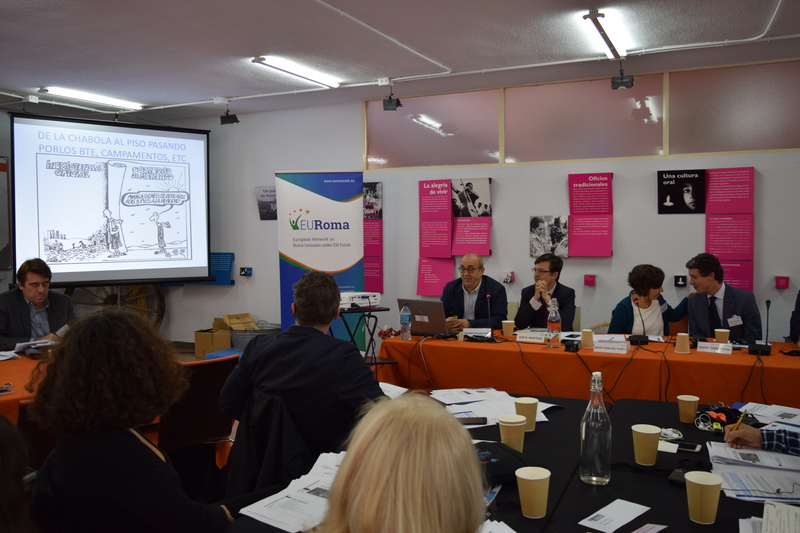 It aimed to gather information about the housing conditions of the Roma population (especially in segregated settlements and substandard housing), to assess the evolution over the last years and to count on evidence to guide public policies and focus intervention priorities. 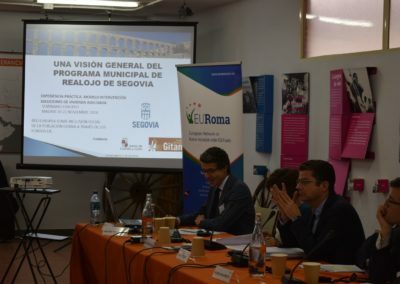 Andrés Torquemada, Councillor for Social Services, Equality, Health and Consumers of the local government of Segovia (Spain) presented the model used by the city to dismantle remaining settlements, notably the last two ones: Madrona Roadway (in the urban area) and El Tejerín (outside the urban area). 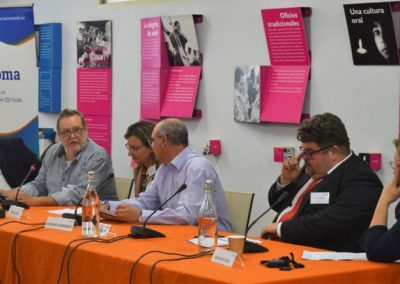 The local government passed a motion to rehouse these families in standardised housing scattered around the city, and to that end, it developed, within the Local Social Inclusion Plan, a specific rehousing plan. 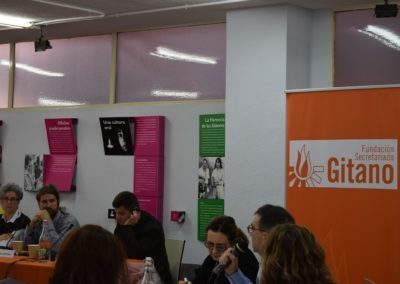 This plan was launched through a public-private partnership between the local government (involving different administrative levels) and social entities (Fundación Secretariado Gitano). An interesting element is the fact that the rehousing processes are conceived as part of a process of improvement of the city as a whole. After dismantling both settlements, the spaces occupied by the settlements where rehabilitated for the public enjoyment. 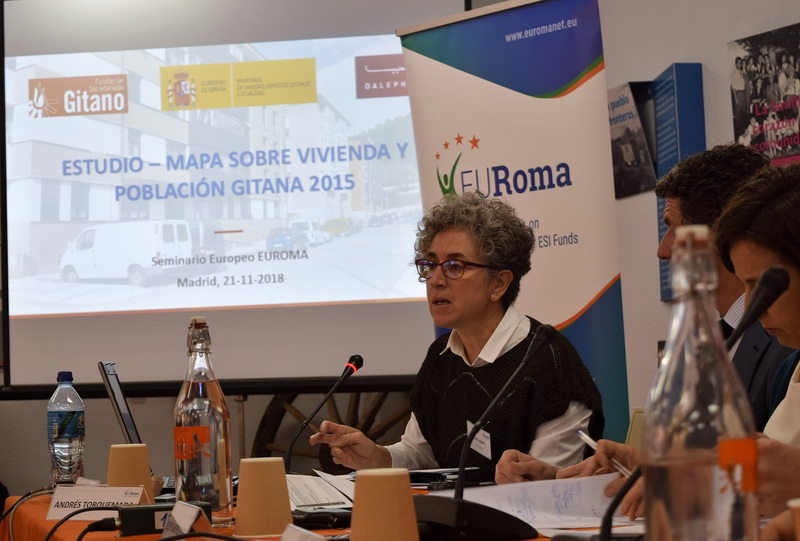 The Regional Pact for the settlement of Cañada Real in Madrid (Spain) is an interesting interinstitutional cooperation model to join forces to address complex housing situations. 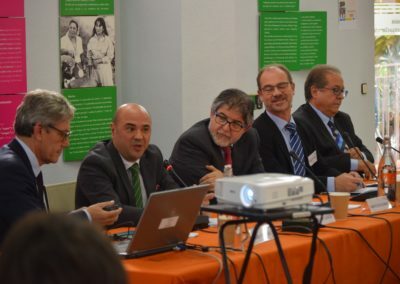 As presented by José Antonio Martínez and Pedro Navarrete, Commissioners for the settlement of Cañada Real of the regional and the local governments of Madrid respectively, this Pact was signed in May 2017 by all key political actors (Central Government, the Region of Madrid, the three municipalities affected and the political groups with representation in the regional parliament of the Region of Madrid) representing a strong political commitment, beyond political parties. Through this Pact, all relevant stakeholders commit themselves to jointly look for solutions to address the situation of this settlement. 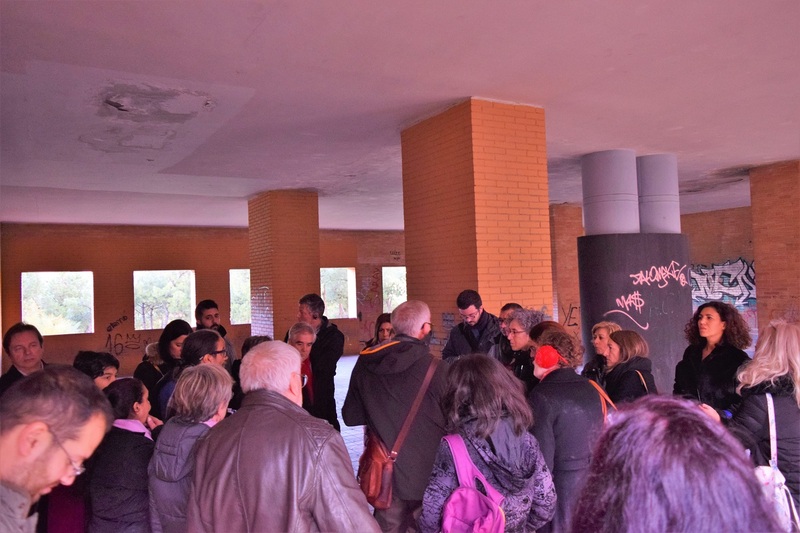 Permanent structures of work and cooperation are set (involving public administrations, social institutions and the neighbours) and different actions are foreseen, including some immediate actions to dignify the living conditions of the inhabitants and other medium-long term. In addition, within the governments of the Region of Madrid and of the city of Madrid, two Commissioners have been set up in order to liaise with the other relevant administrations and guarantee the coordination and implementation of the planned interventions. 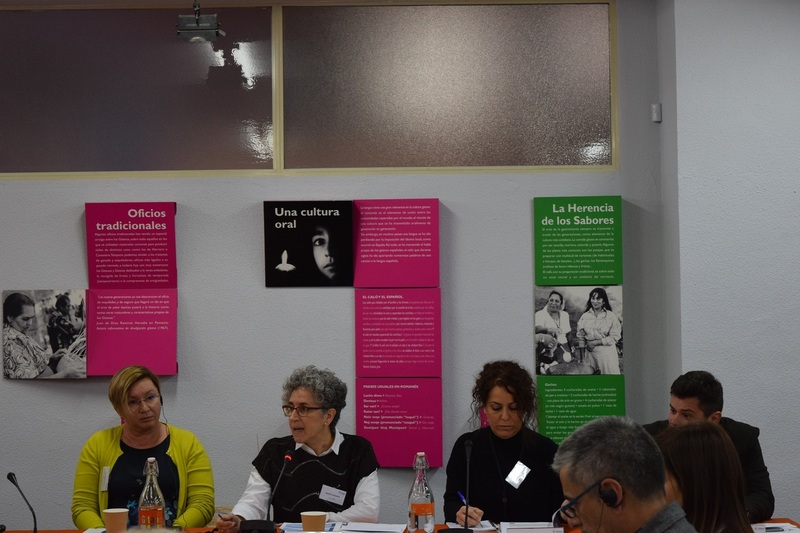 The session ended with the experience of the Region of Navarre (Spain), which in 2017 included, as the basis for their public housing model, the concept of ‘subjective right to housing’. As explained by Javier Etayo, Director of Housing Services, Social Rights Department, Government of the Region of Navarre, following the process of implementation of comprehensive set of housing policy instruments and tools to facilitate access to housing developed over the last years and of reflection on the impact of those, the Government decided to include this concept articulated around two initiatives, supporting the rental capacity of families and individuals: ‘David: Deduction Programme for Access to Housing’ and ‘EMANZIP@: Support programme for the emancipation of young people in Navarra’. Mr. Etayo also reflected on how a generalist public policy can reach disadvantaged groups, notably Roma people. 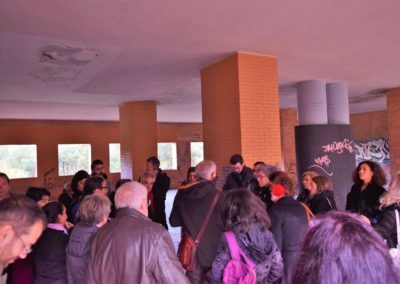 The visit was organised by the Empresa Municipal de la Vivienda y Suelo (EMVS), the public body in charge of public housing schemes in the city of Madrid. 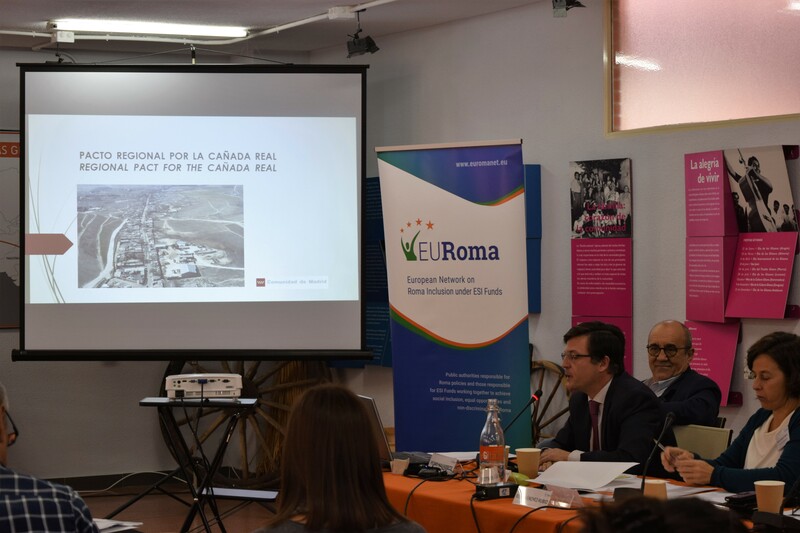 As background to the visit, Romualdo Ruiz Bustos of the EMVS shared with participants an overview of the evolution over the last decades of the housing situation of Roma people in the city of Madrid and the different intervention models used to address it.